Frustrated by the narrow way in which women’s interests and political and civic engagement are often framed (as well as by the lack of women in senior positions in business and politics), Laura Cox Kaplan created the She Said, She Said podcast as a platform to showcase uniquely diverse voices of inspiring women who are making a difference. In addition to She Said, She Said, Laura works as an adjunct professor at American University, and as as a corporate and non-profit board director and adviser. She spends much of her time focused on women’s political engagement, leadership and empowerment, including collaborative efforts with partners in the private, public and non-profit space who are looking to address the various drivers that contribute to the lack of gender diversity, especially in elected office. Her work also includes efforts to increase awareness about the importance of public service as a component of leadership, personal and professional development. Laura frequently speaks before a range of audiences and writes a regular blog. She has been published in Fortune Magazine, The Huffington Post, World Economic Forum Blog, among others. Previously, Laura spent more than a decade on the executive management team of accounting and professional services firm PricewaterhouseCoopers, LLP (PwC), where she led PwC’s public policy and engagement strategy. 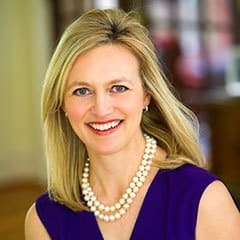 Prior to joining the PwC partnership, Laura served in senior positions at the U.S. Securities and Exchange Commission, and the U.S. Department of the Treasury, where she focused on the legislative and regulatory response to corporate governance and accounting failures in the late 1990s, and on the implementation of the Sarbanes-Oxley Act of 2002. She spent almost 10 years on Capitol Hill as a senior communications strategist. In 2016, Laura received the Alice Paul Alumnae award from American University for her work on women’s political engagement. In 2015, Laura was named one of Washingtonian Magazine’s 100 Most Powerful Women in Washington. In 2014, Laura received a “Trailblazer Award” from the American Law Journal for her work in public and regulatory policy. Laura received a Master’s degree from American University in Washington, D.C. and a Bachelor’s degree from the University of Texas in Austin. Laura and her husband Joel live with their son and daughter in Chevy Chase, MD.